The beautiful Beartooth Mountains are home to glaciers, deep canyons, streams, waterfalls, over a thousand lakes, abundant wildlife, protected wilderness areas, national forests, and North America's largest alpine tundra region. 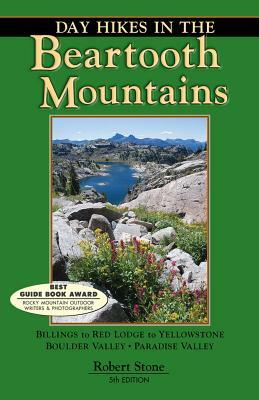 Now in its 5th edition, Day Hikes In the Beartooth Mountains includes an extensive collection of hikes within this mountain range bordering Yellowstone National Park. The 123 hikes range from 10,000-foot plateaus and peaks to treks along the Yellowstone River. The hikes lie within a 120-mile radius of Red Lodge, an active resort and ski town. A range of scenery and hike lengths are included, from relaxing creekside strolls to all-day, top-of-the-world outings. All hikes can be completed during the day. Map sources and references are listed for extending the hikes. Since 1991, Robert Stone has been writer, photographer, and publisher of Day Hike Books. He is a Los Angeles Times Best Selling Author and an award-winning journalist of the Rocky Mountain Outdoor Writers and Photographers, the Outdoor Writers Association of California, the Northwest Outdoor Writers Association, and the Bay Area Travel Writers. Robert resides summers in the Rocky Mountains of Montana and winters on the California Central Coast.